Most folks in the US have encountered the resourceful raccoon. Coexisting with these intelligent animals is far less demanding once you understand their place in the ecosystem. Raccoons are medium sized averaging 20 lbs. They are not in the rodent family but rather more closely related to the bear family. Found almost anywhere in Texas and throughout the US near bodies of water where food can be foraged, the raccoon is opportunistic and insatiably curious. If you find yourself outwitted by a raccoon, don’t take it personally. 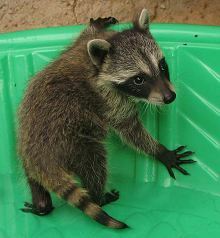 The raccoon’s intelligence is second only to higher primates, according to researchers at Purdue University. Studies have shown that raccoons are able to remember the solution to tasks several years later and have cognitive intelligence on par with a three year old child. While raccoons control populations of rodents, reptiles, insects, and snakes, they also add berries, fruits and vegetables to their diet, as well as poison ivy berries, controlling the spread of this noxious plant. Raccoons are fearless feeders that will eat an entire wasp nest, gang up on a venomous snake, and yes, even dare to venture onto porches and into pet doors to find a meal. Hunters, coyotes, mountain lions, dogs and some birds of prey are the raccoon’s natural predators, while automobiles and the nuisance wildlife industry probably do more harm than all natural predators combined. Possession of a raccoon is illegal in Texas, but permits are available through the Texas Parks and Wildlife Department for wildlife rehabilitation and research uses. These laws have not stopped a few well-meaning folks from attempting to raise a raccoon as a pet, which typically has a tragic ending. The animal becomes destructive due to its innate curiosity, abilities and instincts when deprived of its natural habitat. When law enforcement intervenes, the beloved “pet” is confiscated and euthanized and the citizen receives a hefty citation. Although exceptional climbers, very clever, and gifted with an excellent sense of smell, the life span of a raccoon in the wild rarely exceeds two to four years. Keeping a raccoon illegally then releasing it when the novelty wears off is also illegal, and life threatening to an animal that did not learn survival skills his mother would have taught him. Trapping and re-locating is a death sentence does not resolve conflicts! If you desire to keep wild animals away from your property, the raccoon may give you a challenge. The Humane Society of the United States explains that when home owners are confronted with wildlife living up-close in their own homes or backyards, well-meaning folks often resort to what they see as the most humane solution - live-trapping the animal and then setting her free in a lush, leafy park or other far-away natural area. It sounds like a good idea, but the sad truth is that live-trapping and relocation rarely ends well for wildlife, with research showing survival rate chances at only 20%. Moreover, it is never a permanent solution. Suddenly she in an unfamiliar place, disoriented, and doesn’t know where to find shelter, food, or water. She is in another animal’s territory and will likely be chased out or attacked nor does she know where to go to escape from predators. She may desperately search for her babies that she is now separated from. One minor scratch from being in the box trap can become a slow, painful death by infection. In the meantime, her helpless young are slowly dying. Even if the orphaned young are discovered, rescued, and taken to a wildlife rehabilitator to be reared, it remains a bleak situation for both the mother and her offspring, and one that could have been easily prevented. This also spikes the reproduction rate as this female is likely to rebreed now. Further the void now left by the removed animal is going to sought to be filled by several other animals in the area. Take one out, two or more of its kind move in. Has the raccoon given birth in your attic? Make her move out. This is called "EVICTION" or "HAZING". You simply annoy the animal enough that she leaves on her own. Vinegar soaked rags near entrances along with turning on bright lights in the attic and playing loud radio tuned to talk stations will get mom annoyed and/or concerned enough to reconsider what she assumed was a safe nesting site. Never use ammonia, smoke, mothballs or toxic chemicals. This is your home, too! Be sure to give a mother a few days to remove her babies, and then confirm she has completed doing so. She may divide her time between a couple days after you start your “Hazing” plan. Be sure to stuff newspaper in the entry holes (all of them, there may be more than one) and monitor these. After a few days of seeing no indication of the paper undisturbed you can now feel it’s safe to properly repair the entry sites. Doing so properly means using materials and fasteners that will prevent future intrusions. “Once a den site, always a den site!” Unless you repair and “exclude” properly it will happen again with future raccoons. So you can see, removing THIS raccoon isn’t the actual solution to this conflict; proper exclusion is. Properly securing your trash receptacles and removing other attractants such as pet food, bird feeders and BBQ grills is where reducing wildlife conflicts starts – and often ends. A simple bungee cord is no match for the wise and dexterous raccoon! But many effective solutions do exist today. Google it! You are the human, the most intelligent being on this planet. Please don't result in killing another being so much smaller than you when it's really this simple to solve your problem. If you are concerned about rabies and other disease, please read on. To be sure, generations before us managed to coexist with wildlife, and survived all the risks and fears that are still with us today, such as the myth about raccoons as carriers of disease. Human deaths due to rabies are nearly zero in the US, except for a few unfortunate victims bit by a rabid dog while visiting a foreign country. Most wildlife experts agree that distributing rabies vaccine into the wildlife population using bait is the most effective prevention method for eradication of the virus. Rabies vaccine oral bait drop programs for wildlife have been used in affected areas throughout the US with tremendous success. Raccoons, skunks, bats, foxes, and coyotes are called RVS species, or rabies vector species, meaning they are susceptible to this disease if they are not vaccinated. According to the US Centers for Disease Control, the unvaccinated population (humans, unvaccinated pets, other mammals and some rodents) must be infected by the saliva or bite from a rabies infected animal in the contagious final phase of the disease. Then, this animal is only “contagious” when the virus has passed incubation, become active and now affected its brain, CNS system and is in the saliva. At this late stage, the animal is noticeably ill and will be dead in 2-10 days. Rabies can only be confirmed by sending the brain to a lab for testing. Hundreds of thousands of brains are submitted; relatively few return a positive result. Yet each year some 25,000 people receive post-exposure “just in case” rabies shots. This certainly skews statistics. But testing is as much a billion dollar industry as it is a significant cost for the US. Because rabies is a potentially fatal health concern, experts encourage simple preventive measures such as vaccinating pets and not handling unknown (stray) animals or wildlife. Parasites are another potential hazard, although wild raccoons are immune to it some raccoons may carry “the raccoon roundworm”, or Baylisascaris procyonis. In reality, over 90 species of both wild and domestic animals can host this roundworm and other parasites. Keeping pets routinely de-wormed is common sense, as is not eating poop or sticking objects on the ground in your mouth, which may be a concern for small children. To date, less than 30 cases of B. procyonis have ever been recorded in humans in the US, in the entire history of recording this. For perspective, consider the fact that the common dog roundworm blinds approximately 400 children a year, and vending machines kill 50 people a year. Contrary to popular belief, raccoons are not nocturnal and observing them out during daylight hours does not mean the animal is ill. Raccoons are cathemeral or sometimes called metaturnal, which is defined by Wikipedia as follows: "The activity of an organism may be regarded as cathemeral when it is distributed approximately evenly throughout the 24 h of the daily cycle, or when significant amounts of activity, particularly feeding and/or traveling, occur within both the light and dark portions of that cycle. In safe areas, parks and neighborhoods today it is not so uncommon for mother raccoons and adventurous youngsters to be seen in the daytime. A sick animal will show obvious symptoms. Raccoons pant and even sweat when overheated. Distemper disease, or having fallen or being hit by a car will present symptoms often mistaken for rabies in raccoons. The best way to prevent distemper is to vaccinate all dogs and cats on a regular basis. If you encounter a sick, injured, or possibly orphaned animal, you can find a list of licensed wildlife rehabilitators on the Texas Parks and wildlife website. If the animal is not in immediate danger from predators or the elements, leave the animal there until you speak with a rehabilitator. They are volunteers of the state trained to assist wildlife and will give you the best advice possible. If you live in the Dallas/Forth Worth Metroplex area, please contact the DFW Wildlife Coalition, (972) 234 - 9453 to assist you with orphaned or injured wildlife. If you need help with wild animals raising havoc your property, in your attic, walls, chimney etc, in the Dallas area as well as in Houston, please contact 911wildlife.com, (214) 368-5911, a pest control company owned by a wildlife rehabilitator, who will ensure you that no animal will be harmed. If you live outside of Texas, please click here to find links for every US State wildlife rehabilitation resources. Those who work with wild animals will tell you – they have never met an aggressive animal, only a scared one. Let us not forget that raccoons have but one goal – to survive. Thank you to KATHERINE McGILL, who provided the groundwork for this article. 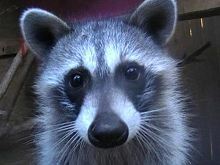 You can visit her 411 Raccoon Solutions website HERE!